Vol. 20 Day 144 P.E. This week, Trump signed an Executive Order to direct the Environmental Protection Agency, under the direction of Scott “Heat Miser” Pruitt, to withdraw from the Obama administration’s Clean Power Plan. The Clean Power Plan is (soon to be “was”) our country’s most significant attempt at curbing greenhouse gases by shuttering scores of coal fueled power plants and moving to renewable sources. Trump trumpeted (honestly, I’m disappointed in myself that this is the first time I’ve used that phase) this EO as putting coal miners back to work. That sounds great. Americans have always had a soft spot for coal miners, whether it was Sissy Spacek’s dad, Derek Zoolander’s brothers and father or Boyd Crowder and Raylan Givens digging coal together. However, Trump’s April Fools’ joke is that coal mining jobs are never coming back. Automation killed the coal miner. In 2015, total U.S. coal production was slightly higher than in 1980, but with nearly 60% fewer workers. We interrupt this post for the first TrumpShaker Pop Quiz! How many people work in the coal mining industry? Don’t look ahead. If you need a hint, I can tell you that there are about 123 million people currently employed full time in the United States, 2.2 million of whom work for Walmart. The answer is that there are about 76,000 coal miners. That’s it. Trump is sacrificing our environment to protect jobs in an industry that employs about the same number of Americans as the vaunted bowling industry and half as many people as theme parks. As an aside, I would definitely get behind a “Make America Bowl Again “campaign and a push to create a giant log ride along the border instead of a wall. You can have those ideas for free for 2020, Senator Booker. Even with Trump’s protection, the coal industry will continue to decline due to cheaper natural gas. For those 76,000 still mining, they can look forward to polluted streams by their homes since the GOP-led Congress recently rolled back regulations that protected waterways from mining debris. Also, an already dangerous job may become even more hazardous if a bill in the West Virginia Senate passes to eliminate enforcement of health and safety standards in mines. The best way to help those suffering from the decline of mining as well as our environment would be to offer retraining for new careers. Wait for it . . . Trump’s proposed budget cuts funds for economic development programs in Appalachia. Nunes spent the first half of the week saying he would never ever share the source of the classified material on surveillance that Nunes had viewed in the middle of the night on White House grounds. The New York Times said “challenge accepted” and found that two Trump administration officials, senior director for intelligence at the National Security Council Ezra Cohen-Watnik and White House Counsel’s Office lawyer Michael Ellis, were Nunes’s sources. It’s unlikely those two shared this info on their own initiative, so stay tuned to find out who ordered the code red. When Nunes wasn’t busy trying to explain how and why he felt compelled to brief the White House on classified documents that had been secretly provided to him by the White House, he filled his day by hampering his committee’s investigation of Russia’s interference in the election. He cancelled hearings with former director of national intelligence James R. Clapper and former CIA director John O. Brennan. He also cancelled a hearing from former acting attorney general Sally Yates, whom Trump had fired weeks earlier. Many viewed Nunes cancelling the Yates testimony as a direct favor to Trump after The Washington Post reported that the Trump Administration had tried to prevent Yates from testifying. Ending his week, in honor of Jesus’s strong held belief in not speaking truth to power, Nunes said there would be no further investigative work or hearings until after Congress takes its two-week Easter break. The good news for America is that there may still be a handful of adults left in Washington. The Senate Intelligence Committee launched its investigation of Russian interference with the election this week and has made it through almost a week without the flagrant partisanship and bumbling incompetence of the House investigation. For Once, Trump Won’t Throw Us a Curve. 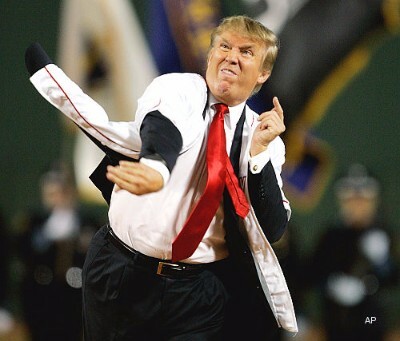 President Trump declined the opportunity to be booed by thousands and recreate the magic moment above from 2006, by throwing out the first pitch in this week’s season opener for the Washington Nationals. I was really looking forward to Trump bouncing the pitch, blaming Nationals back-up catcher and Venezuelan citizen José Lobatón for it and then changing his travel ban to include Venezuela. The (Stock) Price Is Right – Health and Human Services Secretary Tom Price continues to be nagged by reports that he used his position in Congress to help his stock portfolio. ProPublica reported that on the same day he purchased $90,000 in stock in six pharmaceutical companies, then Congressman Price made a call to a senior U.S. official to argue against a proposed rule that would have hurt the bottom line of those six companies. GOP in the Machine –President George “Internets” Bush and Alaskan Senator Ted “Series of Tubes” Stevens long ago established the level of comprehension in the Republican party of the internet. A lack of understanding has not stopped them from impacting your ability to watch deeply disturbing ice cream commercials in private. Republicans voted this week to allow your Internet Service Provider (e.g., Comcast) to sell your browsing information. It’s now on Trump’s desk. Rumors are that the Republicans and Trump will be taking on Net Neutrality next. They would like to undermine the FCC’s current approach, which requires that all data be treated equally on the internet. That is, Comcast can’t provide one speed for (or even block) ice cream videos and a faster speed for their own content. Net Neutrality is critical to the egalitarian nature of the internet. Free Press has a quick “Net Neutrality 101” to prepare you for the fight. Gorsuchbustsers – With the somewhat surprising declaration of Democratic Senator Claire McCaskillof Missouri that she will support a filibuster of Supreme Court nominee Neil Gorsuch, the Dems now stand just 5 Senators short of being able to hold a filibuster. If they do, Trump then can either pull Gorsuch or more likely, the Republicans can change Senate rules to allow Gorsuch’s approval by a simple majority. The vote should happen this week. For those of you in California who complain that you don’t have anything to do since all your reps are anti-Trump, Senator Dianne whether Feinstein has yet to declare she’ll support a filibuster. So now who you gonna call? Are We in Kansas Anymore? Kansas has been under particularly harsh Republican rule as Governor Sam Brownback has been using the state as an experiment to see if eliminating regulations and slashing taxes would create a real Emerald City. Spoiler Alert: It was an economic twister. He destroyed the state’s economy AND public services. In response, voters have elected more sane representatives. Things have changed so much, that Republican and Democrat state reps actually came together to finally approve Affordable Care Act Medicaid expansion into the state. This would mean 180,000 Kansans would get health insurance and at a cost to the state of Kansas of only 10 cents on the dollar. It’s rare that a politician has the opportunity to bring so much relief to so many. So naturally, Brownback vetoed it. This week, we’ll see if Kansas can find the 3 additional votes in the House and 2 additional votes in the Senate it needs to override the veto. My Dinner with Mike (as long as I’m not a woman) – This week we were reminded that Vice President Mike Pence never eats dinner alone with a woman other than his wife and won’t attend events with alcohol without her either. This is a problematic for a host of reasons – it denies women agency, limits access for women to those in power, and provides very troubling insight into how irresistible and uncontrollable Mike Pence thinks he is. Holding Out for a Hero – With access to women’s health care at stake and the vote 50-49, Senator Johnny Isakson (R-GA), recovering from two back surgeries, made his way to the Senate floor for the first time since February 17 – the orchestra music swells – to cast the tying vote – crescendo – to allow state and local governments to pull Title X funding (contraception, fertility, pregnancy care, and cervical cancer screenings) to organizations that also perform abortions, i.e., to take funding from Planned Parenthood. With a tie vote, the man who has 0 years of experience relating to any woman besides his wife, Mike Pence, cast the deciding vote. Of note, is that two of the five GOP female senators, Susan Collins (R-ME) and Lisa Murkowski (R-AK), voted against their party’s repeal of this Obama administration rule. Trump Lies for the Queer Guy – During his nomination speech, Trump said he “will do everything in [his] power to protect our LGBTQ citizens” and as recently as January 30 said he would enforce President Obama’s executive order to protect the LGBTQ community from workplace discrimination. This week, Trump decided “nah.” Last Monday, he signed an executive order to get rid of the requirement that companies prove they are in compliance with Obama’s order to not discriminate. So companies are still required to not discriminate, but in order to get a federal contract you don’t need to prove that you haven’t been discriminating. Basically, the federal government is saying don’t break the law, but we won’t check if you do. After 2020, this issue may be moot, since the Census Bureau also announced this week that they will not include a question on sexual orientation or gender identity on the census. If you don’t count LGBTQ citizens, they don’t exist, and therefore can’t be discriminated against. Trump does it again, problem solved! Like Uber But for Kindergarten – Secretary of Education Betsy DeVos compared parent choice in education to using Uber instead of a taxi. Such a spot-on analogy; it’s such a relief to have a leader who finally understands my desire to put my child in the hands of an unsupervised, unregulated, and inexperienced stranger. The Los Angeles Times kicked off a four part series on Trump this morning with “Our Dishonest President“. This article describes Trump’s border wall as a “cockamamie” idea. If I’m remembering my history correctly, that is the first time a President has been called “cockamamie” since Teddy Roosevelt in ought five. This week the Ways and Means Committee voted along party lines against a resolution to request Trump’s tax returns. It’s now time for our voices to be heard! 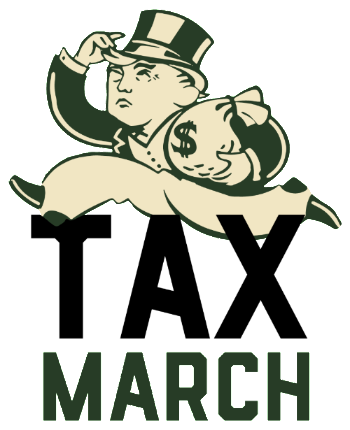 Get your taxes done early, so you can join the Tax March! Audit TaxMarch.org to find where to (march in single) file. Previous Post:Vol. 19 – 137 P.E.